Healy Alaska has a host of fun activities for any sort of interest. 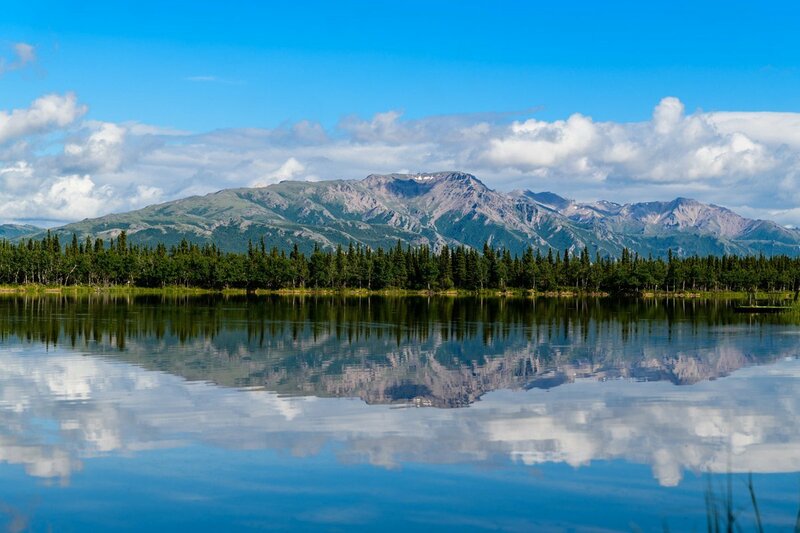 Surrounded by the stunning vistas of Alaska, and close to Denali National Park, visitors staying at Denali Touch of Wilderness will find a variety of day trips which will make memories for a lifetime. From visiting the mushing dogs of Alaska to taking a flightseeing tour to see the vistas by plane or rafting down the rapids, a visit to our area is never dull. And, our B&B will be there to welcome you back to the comforts of home after your adventures. 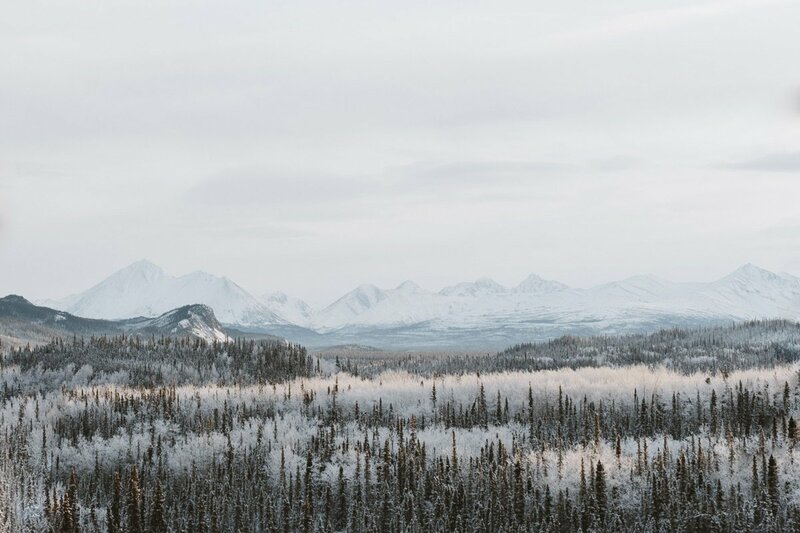 Explore some of the points of interest near Healy Alaska and the Denali Touch of Wilderness, including Denali National Park, Nenana's Historic Train Depot, Fairbanks, AK, and even see the Northern Lights if your timing is just right. For more information visit the Denali National Park and Preserve website. Located 0.75 miles inside Denali National Park & Preserve on the Park Road, the Denali Bus Depot is the departure point for all shuttle buses as well as for tour passengers ticketed to depart from there. Tickets are also available, by walk-in, at the Denali National Park visitor center beginning two days before the travel date. In order to receive a refund for walk-in reservations, cancellations must be made at least 2 hours prior to the bus departure. Denali is the highest mountain peak in the United States and North America with an elevation of 20,320 feet above sea level. Visitors from all over the world come to see this mountain located in Denali National Park & Preserve. "Denali" is an Athabascan name, meaning "The Great One" or "The High One." Denali Park Road is 92 miles long. Visitors are able to drive their personal vehicles 15 miles in to Savage River. From there, the road is gravel and limited to bus service only. Since we are only 2 hours away from Fairbanks, a lot of our guests make it their day trip. There is so much to see and do. With the long summer days, you will have plenty of time to see the sights and be back here to lay your head and sleep. As you can see May-Jun-Jul-Aug have between 15-21 hours of daylight. It makes one feel as if they have an extended vacation. June & July have over 20 hours of "midnight sun." While most things close for the season—we are OPEN! And there are still many adventures to be had at this time of year. One of the most common misconceptions is that Denali National Park & Preserve is closed in the winter. It is NOT. Our location of the B & B in Healy Alaska is only 16 miles from Denali Park entrance. The Aurora Borealis is actually the glow of solar particles blown into the earth’s magnetic field more than 60 miles above the earth’s surface at speeds up to 35,000 miles per hour. The streams of charged solar particles surge and bulge along bends in the earth’s magnetic field. As they strike atoms in the earth’s atmosphere, they create greenish-yellow, faint blue, or even blood red curtains of color. 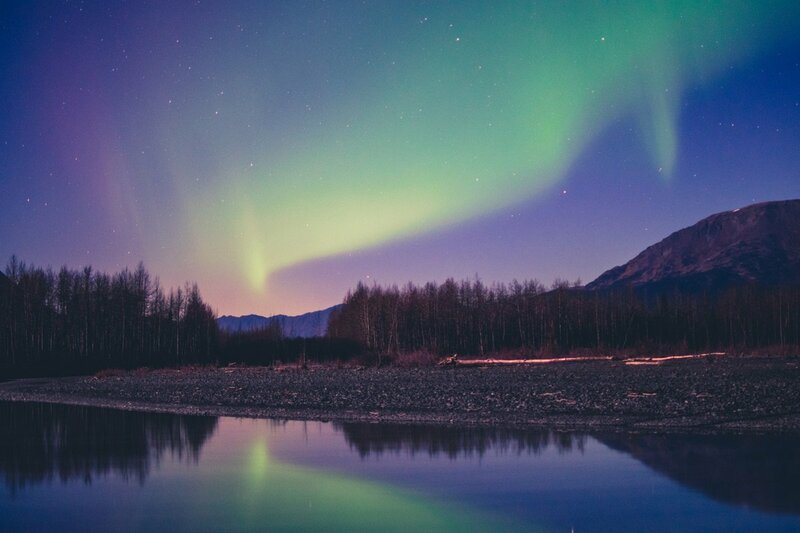 Alaska is the best place to see the Northern Lights, especially in Feb/March and late September to October, because the Earth's orbit is in a zone of maximum solar activity during these months. In addition, those months provide dark skies and mild temperatures. The Northern Lights are most active late at night or early in the morning. Check out the University of Alaska's aurora forecast. Also since we are so close to Fairbanks—you can take a day trip and still get to see the Northern Lights—in the form of a show that provides a panoramic slide photography display of the Northern Lights on a 30-foot screen set to music and photography by LeRoy Zimmerman called The Crown of Light. Then you can tell your family - "I got to see the Northern Lights!" Outdoor recreation in Healy Alaska and near the Denali Touch of Wilderness is what most people visit the area for. Many people come to see (or sometimes hunt) the varied and majestic wildlife in the area. You can also experience the beauties of Alaska by raft, bike, ATV, or plane. Don't forget to tour the national parks in the area, spend some time fishing and see some of the one-of-a-kind Alaskan cultural experiences, like mushing or ice sculpting. The moose is a symbol of life in Alaska. It is the largest member of the deer family. Moose are long-legged and heavy bodied with a drooping nose, a “bell” or dewlap under the chin, and a small tail. Newborns weigh 28-35 lbs and w/in five months grow over 300 lbs. Males in prime condition weigh 1,000 to 1,600 lbs. Only bulls (males) have antlers and can stand over 7 feet at the shoulder. Rarely do moose live longer than 16 yrs. A cow (female) moose defends her newborn calf vigorously. More people hunt moose than any other of Alaska’s big game species. Hunting season is during autumn and winter. Moose outnumber bears nearly three to one in Alaska. Moose attacks spike in September and October during mating season and early spring when mothers are protecting their young calves. If you notice their hair raised, head down and ears back or licking its lips, that’s your cue to hightail it in the opposite direction, running in a zig-zag formation. Moose are taller than a horse, heavier than a bear, and faster than a kangaroo, running up to 35 miles per hour. While moose are generally perceived to be less dangerous than bears, more people are actually injured each year in Alaska by moose than bears. Alaska has the highest rate of moose-vehicle collisions in the world. There are “white” moose… 1 in 100,000 moose has the albino trait, which is recessive. Alaska is bear country. Here in the interior, you can find both black bears and brown bears. Black bears are 5 feet long; males can range from 150-400 lbs, and females from 125-250lbs. They are brown to black in color with a white patch on the front of the chest. 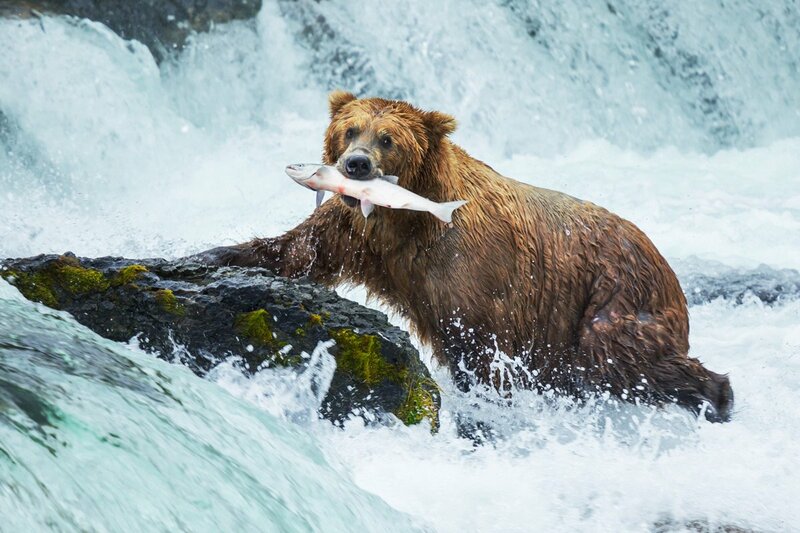 Alaska is also home to North American Brown Bears, also known as the grizzly bear. Grizzly bears are 7-9 feet long, with males weighing in at 400-1,100 lbs and females from 200-600 lbs. They have lifespans up to 30 years with a normal lifespan being 20-25 yrs. Grizzly bears are more aggressive than black bears. Most bears are by nature shy and prefer to avoid people. Caribou are part of the reindeer family. Both sexes grow antlers, but males have larger antlers. Reindeer are thought to be the only mammals that can see ultraviolet light. Caribou have large, concave hoofs that spread widely to support the animal in snow and soft tundra. Adult bulls average 350-400 pounds, while mature females average 175-225 pounds. Bears and wolfs are their predators. Fun Fact: There are more caribou than people in Alaska. Dall Sheep inhabit the mountain ranges of Alaska. These white creatures are most notable for the males' massive curled horns. Females (known as ewes) also carry horns, but theirs are shorter and more slender and only slightly curved. Until rams reach the age of 3 years, they tend to resemble the ewes quite a bit. After that, continued horn growth makes the males easily recognizable. Horns grow steadily during the spring, summer, and early fall. In late fall or winter, horn growth slows and eventually ceases. Dall rams as old as 16 years have been seen, and ewes have been known to reach 19 years of age. Generally, however, a 12-year-old sheep is considered quite old. They can grow up to 300 pounds. Their predators are wolves, coyotes, and golden eagles. Also known as the grey wolf or the timber wolf. Alaska is home to an estimated 7,000 to 11,000 wolves. Wolves have never been threatened or endangered in Alaska; although there was some speculation in a recent article in the Fairbanks Daily News-Miner that there is now cause for concern. Most adult male wolves in interior Alaska weigh from 85 to 115 pounds, but they occasionally reach 145 pounds. Females average 10 to 15 pounds lighter than males and rarely weigh more than 110 pounds. Wolves reach adult size by about 1 year of age. Fun Fact: There are 12 species of big game besides the Denali Big Five that includes musk oxen, wolverine, mountain goat, black-tailed deer, elk, and ram. Click here to visit the Black Diamond Adventures website. Black Diamond Adventures is a small family owned Alaskan business located in the heart of Alaska that has been in business since 1995. They offer great custom tours for the entire family and would love to have you join them for some fun in the midnight sun state. They pride themselves on making your experience unique and personal. Denali raft Adventures INC. specializes in whitewater rafting. Friends and families will have the opportunity to enjoy the natural wonders and beauty of this spectacular destination with some of the best available adventures for all ages and abilities near Alaska's crown jewel, Denali National Park. We especially love the Canyon Whitewater Run 2 Hour Adventure (Class III & IV rapids) and McKinley Scenic Run 2 Hour Oar Raft Trip. Ask us for more information, we'd be happy to help you learn more! Our flightseeing and air taxi partners offer the most extensive flightseeing tours of Denali and Denali National Park. Enjoy the experience of viewing the grandeur of the Alaska Range and its glaciers up close and personal. Experienced, professional Alaskan pilot-guides will add to your enjoyment as they narrate your flight with an interesting history, geology, and local lore. Your intercom allows you to talk to your pilot and other passengers, and everyone gets a window seat! Glacier landings and heli-hiking opportunities are also available. The most extensive tour of McKinley available anywhere. Includes a complete tour of McKinley's glaciers and surrounding peaks plus the added excitement of going right over the top! 1.3 hour flight time. Both tours are exclusive offerings from the Denali National Park entrance area. Tour time is 2.5 hours, including 1.8 hours flight time plus 30 minutes on the glacier. Experience the backcountry with a professional naturalist guide. A short flight will leave you and your guide in the Yanert Valley to explore for approximately 3.5 hours. Customized to the group’s ability. Explore the beautiful Yanert Valley, located at the base of Mt. Deborah. Just east of Denali Park, view cascading icefalls and the Polychrome Mountain Range. Highlight your tour with a 20-minute landing on the Yanert Glacier. Glacier boots provided. For more information go to their website at: www.flightseeingtours.com. Denali Park Day Excursion (Fly/Drive) Experience Denali Park from the air and the ground. The flight takes you through the heart of Denali Park, giving you a spectacular scenic view. Choose Direct Flight or the Scenic Flyby, which includes flying you to the North face of Denali, traversing the expansive Muldrow Glacier and following the spine of the magnificent Alaska Range. You can't come to Alaska without getting your line wet. Denali Fly Fishing Guides offers a variety of guided fishing trips from late May to early September. Denali Fly Fishing Guides specializes in Arctic grayling, the sailfish of the North. The North flowing Nenana River drainage on the doorstep of our Cantwell office offers bountiful natural grayling stocks. They can also have natural rainbow trout stocks in the South flowing drainages. Trip options include full and half day grayling catch and release, jet boat fly fishing, and scenic float trips. All Gear, Flies, Rain Jackets and hip waders are included. Pick up from any of the park area hotels. See a part of Denali that you can't see from inside a bus. Four unique guided adventures with tour times throughout the day. Single and double ATVs are available. This is a fun adventure for all ages. For more information call(907) 683-4288 or (909) 978-2094 (cell). Or go to the website. Travel in comfort, to the beautiful Kantishna Historical District. View the Wonders of Nature and the Wildlife that make it their home. Enjoy a full hot lunch and guided activities. Stretch your legs and relax or choose from a free dog mushing demonstration or an interpretive program. These tours don’t offer discounts that I can pass on to my guests, but most everyone takes a bus tour into the park. All I can do is give you the information to help you make your decisions. Go to the Denali park page. Click on Fees and Reservations: This page will tell you about the park fees and Park Passes. At the bottom of the page, you will find links to park bus fees. Click on the Bus Fees and that will show you the Shuttle Bus Fees, their destinations and fees, and the Tour Bus Fees (which are narrated and more comfortable bus) their destinations and fees. Please keep in mind that there is only 1 road into the park and all tours travel the same road. Tours are determined by distances into the park. Make reservations online, by fax, or by phone: 1-800-622-7275. All of that information is on the park site. At our riverside location, visit with Alaskans that make their living and raise their families in the wilderness near Denali. Your hosts are woodsmen, trappers, hunters, showing you their Alaska. They will share stories, tales and a few tricks regarding mining, prospecting, trapping and hunting that make their lives different than most that come to visit. Heated Jet boats into the “bush,” where locals share hunting, prospecting, trapping and dog mushing lore on the Nenana River. Price includes round-trip transportation to and from any hotels outside park area. Visit with Alaskans that make their living and raise their families in the wilderness near Denali, share a welcome snack at camp, show and talk about furs then end your trip with an exciting pull cart sled dog ride. Jon & Karin Nierenberg - Owners of Henry's Coffee Shop- you can hike from our place (a 1-mile hike) and have dinner and a enjoy slideshow for a small fee. You can even visit his real live Alaskan Mushing Dogs. Come and experience the adventure of a lifetime. Snowmobile in the Alaskan Interior. Your guide Coke Wallace will take you to the most exciting trek into Alaska's wild country. Make sure to check out the current snow report. The actual event is February 14 - March 31. 30th year of the largest annual ice art competitions and exhibitions worldwide. 70 teams from all over the world, attract more than 100 ice artists and approximately 45,000 visitors from Alaska and all over the world. If you plan a trip in March of 2019 you can have the treat of a day trip to Fairbanks for the annual "World Ice Art Championships." Do you want to be dazzled? Then this is the time to do it. We are only a two-hour drive away from Fairbanks. If you fly into the Fairbanks International Airport, then you can see the competition at the start of your trip or on the end as you fly back out. Then you can catch several amazing adventures: Denali, Northern Lights, Snowmobiling, Mushing, Cross-country Skiing and this! There are so many things to do in Denali. Visit some Alaskan mushing dog, see antique cars, browse through some truly unique museums and visitors centers. Mary Shields, dog musher and the 1st woman to win the Iditarod race in 1974. The Iditarod's path spans from Anchorage to Nome, some 1,100 miles. Here you can visit her Alaskan Huskies, her mushing dogs. Take a 2-hour tour with starting times of 10A-2P and 7:30P. Make sure to reserve your spot; it's on a first come first serve basis and group size is limited. Prices: Adult $35.00 and Children under 12 $25.00. This 1.5 hours guided tour called Vintage Treads & Threads takes you over 30,000 sq ft of vintage cars and clothes. Guys, if you like Vintage cars, you will see 55 American-made, antique automobiles. Ladies, they've paired vintage dresses alongside the cars; so you will enjoy it too. It is fee-based but well worth the cost and visit. Ages 13 and above: $8. Ages 3-12 $5. 2 and under FREE. Summer Hours - (Summer Hours begin Mid-May 2013) Sun - Fri: 11 a.m. to 10 p.m.; Sat: 11 a.m. to 6 p.m.
Winter Hours - Sundays only: Noon to 6 p.m. Opened in September 2009, their exhibits at Morris Thompson cultural and visitors center Denali touch of wilderness are getting rave review and comments from visitors. When you go, you will get to experience how we live. Three life-sized dioramas. A display of a fish camp and a stunning view of Nuchalawoyya—the place where the Yukon and Tanana rivers meet. A grizzly digs for ground squirrels and a hunting camp shows the connection we have with the land. Visitors view the winter diorama from inside the warmth of a public use cabin. Outside, northern lights dance across the sky, while a moose peers through the window. Finish off your experience in the Elder’s hall where you can learn about the Athabascan culture and view historic and contemporary art and tools. They are walking distance from downtown Fairbanks; they offer a theater, video nook, computer access (to check your emails), public phones, and lockers if you want to keep your stuff till you come back from your walk downtown. It's an interactive experience. Summer: 8am-9pm and it is FREE. Make this day trip one of education. They offer a lot of exhibits where you will learn about the history and culture of Alaska. Fairbanks is the capital of ice art in the world and home to the World Ice Art Championships. There you will learn about the natural history of the forest as well as the reindeer themselves. Bring your cameras and expect the unexpected! By appointment only; a guided nature walk in the boreal forest. $35/person, $20/children 3-12, under 3 free. All children must be supervised by an adult at all times. Two-person or $70 minimum. Creamer's Field Migratory Waterfowl Refuge is a 2,000-acre refuge on the site of the historic Creamer's Dairy in Fairbanks, Alaska. The refuge has miles of multi-use trails that are open year round, and it is an excellent location for bird watching and wildlife viewing. Longest trail 2 miles. The Farmhouse Visitor Center is open daily in the summer from 10 - 5 and on Saturdays in the winter from Noon - 4. This activity is FREE. Winter is Sat. only and the visitor center is not open in the winter, but you can walk the trails. One of the most popular tourist attractions in Alaska and it's FREE. The Alaska Pipeline was built by a consortium of seven oil companies. The pipe is 4 feet in diameter in a zig-zag configuration and 800 miles in length From Valdez to Prudhoe Bay. At any one moment, there are about 9 million barrels of oil in the line. It took 3 yrs and 2 mo. to construct. Guided, outdoor walking tours are provided at regularly scheduled times between Memorial Day and Labor Day each summer. Naturalist tour guides enjoy sharing their backgrounds and expertise in the natural history of the farm's animals. Muskox are a true arctic species, living in the far north year round. Their thick layer of underwool, or qiviut, keeps them warm in the harsh cold of winter. Qiviut is softer than cashmere. It is harvested at LARS each spring and sold to be spun into yarn for knitting. Proceeds of these sales are returned to the farm for the care of the animals and the improvement of the facilities. Caribou and reindeer are closely related. Caribou are the wild version of the species native to North America. There are about four million caribous on the continent of North America. Reindeer are the domesticated version of the species. Starting at: 10 a.m., 12 p.m. and 2 p.m.
Gates and picnic area open from 9:30-4:00 daily during the season. Tours meet at the front entrance of the farm, located at 2220 Yankovich Rd., behind the University of Alaska Fairbanks campus. The UAF campus shuttle runs to the farm before and after tours from the Museum of the North. Parking is limited on site. If you choose to park on the UAF campus, the UAF Shuttle will pick up guests at the UAF Woodcenter and bring them to LARS at 9:40 am, 11:40 am, & 1:40 pm on tour days. Call 474-5724 to schedule large groups. One could easily spend a day trip here! A historic theme park. Museums: Alaska Native Museum, Kitty Hensley House, Pioneer Air Museum, Pioneer Museum, Riverboat Nenana, Tanana Valley Railroad Museum, Wickersham House. Located off of Parks Highway on Otto Lake at mile 247, about 8 miles from the Inn, this restaurant serves Alaskan Gourmet-American cuisine. From burgers to steaks and seafood, portions are generous. Shuttle van available. Located off the Parks Highway (Hwy 3) Mile 248.4, or 5.5 miles from the Inn. Known for their award-winning buffalo wings and their handcrafted beer from the full-service brewery. Located a mile past Denali Touch of Wilderness Bed and Breakfast Inn. Located at mile 248.7, or 7.5 miles from the Inn, offers cafe and lounge. A favorite of Healy locals and frequent travelers of the Parks Highway, and is just 4 miles from the B&B. Canyon: Head down the Canyon, just before Denali National Park, and you have many choices: Denali Doghouse, The Perch, The Great Alaskan Fish & Chip Co., Subway, Prospectors Pizzeria & Alehouse, Denali Salmon Bake, 229 Parks, McKinley Chalet Resort.